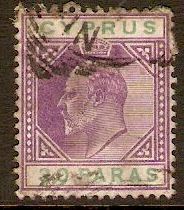 Cyprus 1902 ½pi. Green and Carmine. SG50. 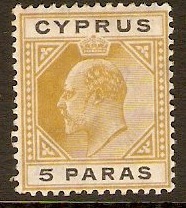 Lightly Mounted Mint 1902 ½pi. Green and Carmine. SG50. Cyprus 1902 30pa Violet and green. SG51. Used 1902 30pa Violet and green. SG51. 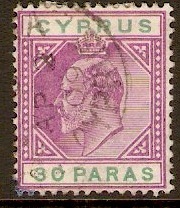 Cyprus 1904 5pa Bistre and black. SG60. Heavy mounted mint 1904 5pa Bistre and black. SG60. 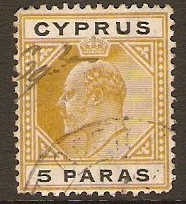 Used 1904 5pa Bistre and black. SG60. 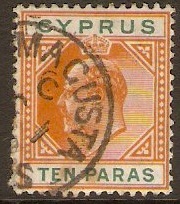 Cyprus 1904 10pa Orange and green. SG61. Fine used 1904 10pa Orange and green. SG61. 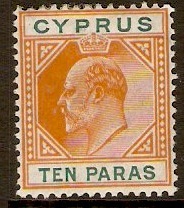 Heavy mounted mint 1904 10pa Orange and green. SG61. Cyprus 1904 30pa Purple and green. SG63. Used 1904 30pa Purple and green. SG63. 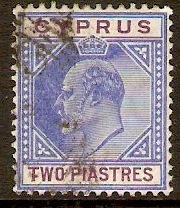 Cyprus 1904 2pi Blue and purple. SG65. Used 1904 2pi Blue and purple. SG65.